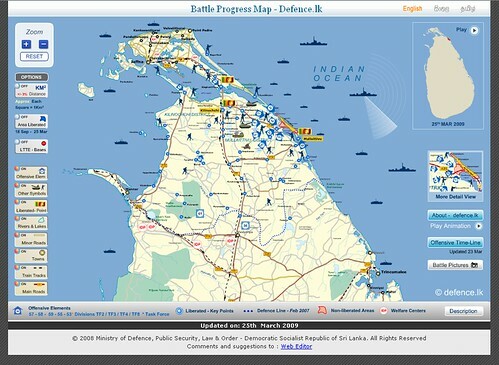 The civil war in Sri Lanka doesn’t get much coverage in American press so a little background is appropriate. 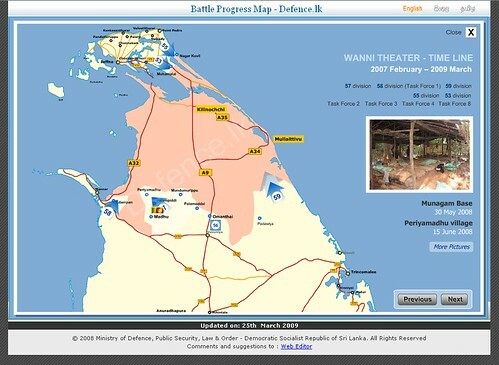 Suffice it to say that the separatist LTTE make a habit of bombing civilians but that the government has killed many and violated human rights as well. The war has been a major impediment to development in a country that could otherwise be called a tropical paradise. What we see here is propaganda being marketed as transparency and access to information. I find it particularly interesting that the map makes the conflict look almost like a video game. You almost want to right-click on the armored units and send them into battle yourself. To gloss over the horrors of war, simply borrow the tropes from a medium that regularly turns fighting into fun and games. The government is intimidating / murdering journalists, and keeping foreign media out of the conflict zones altogether. They don’t want people to know what they are doing over there, and try to rubbish any accounts that don’t match the official line. Most people are too stupid or too afraid to have a problem with this, or they don’t care as long as the war is won. They have started setting up concentration camps (there’s no other word for it). The issue isn’t the scale, or accuracy of distance measurements, the issue is the map is being used to sew fear and produce a desired effect in the populous. It’s probably easier to introduce the idea of invading a place (or planting oil rigs) if it has been on every map of the country everyone has seen since they were kids. In my mind, there is a place for interactive, information-rich but slanted maps like this. Some information is better than no information, and at least here we know it’s from the government so we can make our own judgments. I just hope their visitors have enough context to take that into account and don’t instead see a successful endgame of Civilization III.